The English and Catholic Studies graduate programs at the University of St. Thomas in St. Paul, Minnesota have announced their CFP for the upcoming interdisciplinary conference entitled Roots: Tradition & The New. The conference will be held on April 27, 2018 at the University of St. Thomas. They invite paper proposals on any aspect of literature, faith, visual arts, and culture. They specifically invite papers addressing the topics of Rootedness and growth in literary and religious works. Interested presenters should submit a 400 word proposal via email to RootsConference2018@gmail.com by February 15, 2018. Below is the full CFP. 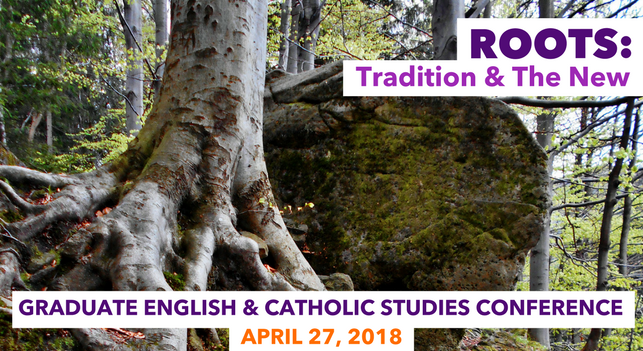 The University of St. Thomas English & Catholic Studies graduate programs will host an interdisciplinary conference on Friday, April 27, 2018. While papers addressing any aspect of literature, faith, visual arts, and culture will be considered, the graduate programs particularly welcome proposals for papers exploring the topic “Roots: Tradition and the New” across all time periods, media, and geographical regions. Download the Roots: Conference CFP. Rootedness and growth have been central to many literary and religious works. The aim of this conference is to explore this theme in an interdisciplinary way, engaging with a wide variety of texts, approaches, traditions, innovations, and points of view. Rootedness and Mobility: home, inheritance, chlidhood, family, the body, or theories of the self; intersectional identities based on faith, race, class, gender, or disability; psychic, epic, and spiritual journeys or pilgrimages; ancestral religion and personal faith; immigration and emigration; educational, imperialist, or leisure travel. Regeneration: rebirth, liberation, emancipation, confession, conversion, incarnation, renewal, revolution, reformation, and revival. Impediments to Growth: dystopia and apocalypse; racism, sexism, and other forms of injustice; constraint, stasis, and entropy; rootlessness. Genealogies: the roots of words, religions, concepts, genres, belief systems, or ideologies. Tree Rings: inner selves, souls, spirits, desires, and motivations. Branching Out: new genres, spiritual practices, identities, textualities, pedagogies, forms of life, or theoretical schools; stability and flexibility; inheritance and originality; modernity. Interstices: spaces between faiths, selves, communities, neighborhoods, genres, stanzas, ideas, and words. Ecologies: links between local, regional, national, and global geographies, literatures, and religions; regionalism, globalism, and transnationalism; urban, virtual, and technoscientific spaces; systems of growth, symbiosis, parasitism, evolution, and development; climate change, environmental crisis, and the Anthropocene. Disciplinary Roots: points of contact and divergence between academic disciplines: Catholic Studies, English, theology, art history, environmental studies, the sciences, professional writing, pedagogy, creative writing, and other fields. We encourage analyses of artistic, religious, literary, architectural, cultural, cinematic, digital and/or other textualities. Proposals for whole panels (three presenters) or roundtables (four or more presenters) are welcome. For consideration, please submit a 400-word abstract for individual papers, panels, or roundtables to the graduate conference coordinators, Mary Catherine-Adams and Sarah Pavey, at RootsConference2018@gmail.com by February 15, 2018.